Co-founder and Chief Scientific Officer of the Dzugan Institute of Restorative Medicine, Deerfield Beach, FL. Dr. Dzugan is a former heart surgeon. International Academy of Creative Endeavors (Russia) awarded Dr. Dzugan with the honorary title of Academician for outstanding contribution to the development of new methods of hypercholesterolemia and migraine treatment. He performed presentations multiple times at the prestigious International Congress on Anti-Aging Medicine and other Medical Conferences. He is the author of 156 publications in medical journals, author of 6 books, holder of 3 patents, and author of numerous articles in health related magazines. Dr. Dzugan is a Member of the Editorial Board of the Neuroendocrinilogy Letters and a member of the Medical Advisory Board at Life Extension Magazine. 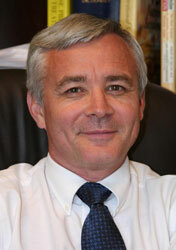 He is co-founder and President of iPOMS (International Physiology Optimization Medical Society). He was formerly a senior heart surgeon and Chief of Cardiovascular Surgery at the Donetsk Regional Medical Center in Donetsk, Ukraine. A total of 15 physicians and 25 non-physician employees required his management efforts in 25 beds department. The service area for the hospital was 5.5 million. His PhD in cardiovascular surgery was received in 1990 and pertained to heart rhythm disorders. He was Associate Professor of Medical University in Donetsk, Ukraine. Dr. Dzugan has worked with the Cancer Center in Greenwood, MS for more than 7 years and was a principle consultant of Anti-Aging strategy and biological therapy of cancer. The Cancer Center was active in clinical research and Dr. Dzugan’s scholarly background as a clinical researcher helped proceed in a more organized and scientific fashion. The American Academy of Anti-Aging Medicine certified Dr. Dzugan in 1998. In October 2003 he moved to Ft. Lauderdale, Florida, and became the Manager of the Advisory Department at the Life Extension Foundation. Later, he became President of Life Extension Scientific Information Inc. In August 2006, Dr. Dzugan left the Life Extensions Foundation to create the Migraine Program, a scientific organization that consults with physicians to develop the optimal plans for their patients to prevent migraine. Dr. Dzugan has had a special training in vascular surgery, combustiology, microsurgery, arrythmology, heart surgery, genetic testing, pedagogics and psychology. Also he has since 1996 twice a year annual continuing medical education activity for credit hours in Category 1 of the Physicians’ Recognition Award of the American Medical Association. Dr. Dzugan’s current primary interests are physiologic therapy for elevated cholesterol, migraine, fatigue, fibromyalgia, behavioral and hormonal disorders. Dr. Dzugan has suggested a new hypothesis on hypercholesterolemia and has worked out an original statin free method regarding hypercholesterolemia treatment. He has also introduced a new approach to the treatment of migraine. Dr. Dzugan was accepted (June, 30 2006) to the International Academy of Creative Endeavors (Moscow, Russia) as a Corresponding Member of the Academy for the outstanding contribution to the development of new methods of hypercholesterolemia and migraine treatment. In December 2007, Dr. Dzugan was awarded with Honoree Medal by this Academy for the personal input into the acquisition of science, culture, physical betterment of nation and strengthening of friendship between nations. The International Academy of Creative Endeavors, an academy of world renowned thought leaders in the sciences and various other fields, awarded Dr. Dzugan with the prestigious, high honorary title of “Academician” for outstanding achievement in the field of science on January 8, 2010. He performed presentations multiple times at the prestigious International Congress on Anti-Aging Medicine and Annual Clinical Applications for Age Management Medicine Conference. The topics of his presentations were “Hypercholesterolemia Treatment: a New Hypothesis or Just an Accident?”, “Role of Immunorestorative Therapy in Non Small-Cell Lung Cancer”, “A New Method of Migraine Treatment: The Simultaneous Restoration of Neurohormonal and Metabolic Integrity”, “Hypercholesterolemia Treatment: a New Statin Free Method”, “The Effect of Multimodal Treatment Program in Migraine Management”, “The Role of Hormonorestorative Therapy in Hypercholesterolemia Treatment”, “The Role of Hormonorestorative Therapy in the Treatment of Major Illnesses”, etc. He also was a speaker at the Third Annual Mississippi Partnership for Cancer Control in Underserved Populations Conference. The workshop was titled “Ask the Expert: Questions on Lung Cancer”. Dr. Dzugan is the author of 143 publications in medical journals and these publications include surgical, oncological, academic and anti-aging topics. Also, several articles were published in Life Extension Magazine and The South African Journal of Natural Medicine. He is the author of 3 books and holder of 3 patents (all related to heart surgery). Dr. Dzugan is a Member of the Editorial Board of the Neuroendocrinilogy Letters and a member of the Medical Advisory Board at Life Extension Magazine. Osteoporosis related fractures pose a significant economic and healthcare problem. Hypercholesterolemia and osteoporosis are highly prevalent conditions for aging patients. The 3- hydroxy-3- methylglutaryl coenzyme A (HMG-CoA) reductase inhibitors (or statins) are frequently used for the treatment of hypercholesterolemia. In recent years there has been high interest in the use of statins for osteoporosis due to the possible effect on bone tissue. Bisphosphonates are currently used for treatment of osteoporosis. Recent studies have shown an association between long-term use of these drugs and atraumatic or low-energy atypical femoral fractures. Stress fracture was originally described by Breithaupt in 1855. Damage to the bone occurs as the result of the imbalance between osteoblast and osteoclast. Bisphosphonates decrease bone resorption via inhibition of the farnesyl diphosphate synthase in mevalonic acid pathway. Statins affect the same pathway only at an earlier stage. Statins inhibit HMG-CoA reductase, preventing synthesis of mevalonate but also of isoprenoids, which affect osteoclast activity. Bisphosphonates have similar effect on osteoclasts. Statins and bisphosphonates have a major impact on cholesterol biosynthesis pathway. In this presentation we present our point of view on low-energy (stress) fracture that was associated with a long term statin and bisphosphonate therapy. A 65-year- old woman was presented with a stress fracture of the left femur. Based on our review of literature to date there are no reports available on combined effect of statins and bisphosphonates on risk of stress fractures. We believe that the concurrent use of statins and bisphosphonates should be carefully studied because of a possible negative cumulative effect of these drugs on cholesterol biosynthesis, steroidogenesis, and bone homeostasis, which could lead to an increased risk of low-energy (stress) fractures. Unfortunately, current very limited evidence is not conclusive and further research is necessary.